In delivering the Annual Report of the Bank to the House of Representatives Standing Committee on Economics, Finance and Public Administration on August 18, 2006, (now former) Reserve Bank of Australia Governor Ian MacFarlane expressed concern about Australia’s house prices, which had escalated severely in relation to incomes. "…why has the price of an entry-level new home gone up as much as it has? Why is it not like it was in 1951 when my parents moved to East Bentleigh, which was the fringe of Melbourne at that stage, and were able to buy a block of land very cheaply and put a house up on it very cheaply? Why is that not available? Why is that not the case now?" MacFarlane told the Committee that “that reluctance to release new land plus the new approach whereby the purchaser has to pay for all the services up front—the sewerage, the roads, the footpaths and all that sort of stuff—has enormously increased the price of the new, entry-level home. That is a supply-side issue, not a demand-side issue.” MacFarlane questioned whether the existing “land release policies” are “front-loading of all charges” are the right set of policies. For context, by the time of MacFarlane’s testimony virtually all Australian states as well as the Australian Capital Territory (Canberra) and the Northern Territory had adopted land release policies characterized by urban containment strategies (called “urban consolidation” in Australia) with urban growth boundaries (or equivalent). These policies severely ration or even prohibit new houses from being built on the urban periphery. These policies mimic those of Great Britain, which spread not only to Australia, but also to other metropolitan areas around the world (such as Vancouver, Portland, Seattle, San Francisco, Toronto, Auckland and many others). It should not be surprising that much higher land prices are associated with urban containment’s rationing of land, much like petroleum prices shot up during the oil embargoes of the 1970s. 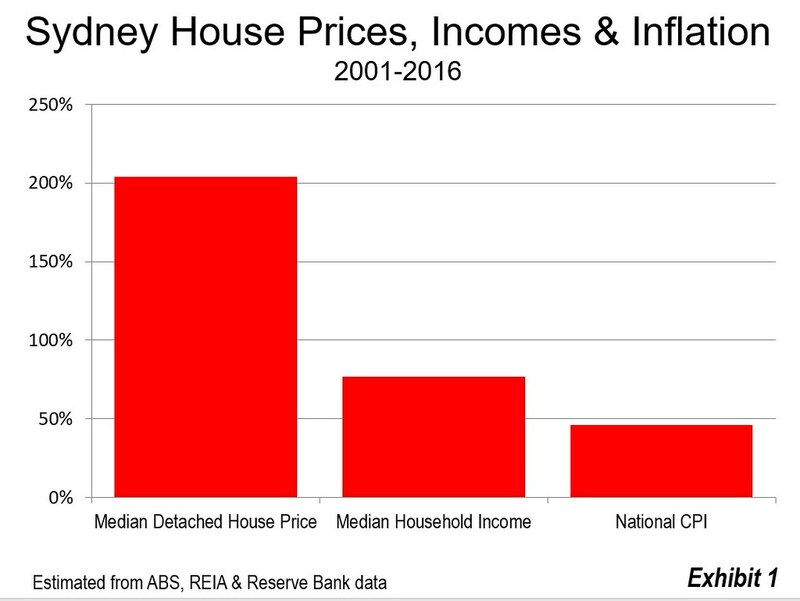 Meanwhile, corrective policy reforms have not been implemented by the states and housing affordability has deteriorated compared to median household incomes and inflation, as is clear by looking at Sydney (Figure 1). This insight is illustrated by a new report by Reserve Bank of Australia (RBA) economists Ross Kendall and Peter Tulip (The Effect of Zoning on Housing Prices). According to supplemental data published with the report, the effect of overly restrictive land use regulations, which the authors call the “zoning effect,” had added considerably to the cost of the detached houses that most Australians prefer. By 2006, the zoning effect had already added 55% (nearly $155,000) to the cost of a house in the Sydney metropolitan area, up from 21% in 2000. This phenomena was also significant by 2006 in the three other largest metropolitan areas studied by Kendall and Tulip, Melbourne, Brisbane and Perth, where the zoning effect added from $74,000 to $98,000. Australia’s other major metropolitan area (more than 1,000,000 population), Adelaide, was not included in the analysis, though its housing affordability is now the third worst, behind Sydney and Melbourne. Actually, the term “zoning effect” is insufficiently precise. There are plenty of arguments for and against zoning, but zoning’s effect on housing affordability between metropolitan markets was only marginal until metropolitan areas began adopting urban containment. Pre-urban containment zoning, such as parking requirements, permitted uses in small areas of a municipality and building lot sizes have not been associated with housing affordability differences that can “hold a candle” to the huge differences caused by urban containment. The message of the RBA report is that houses are more costly because as a result of urban containment. 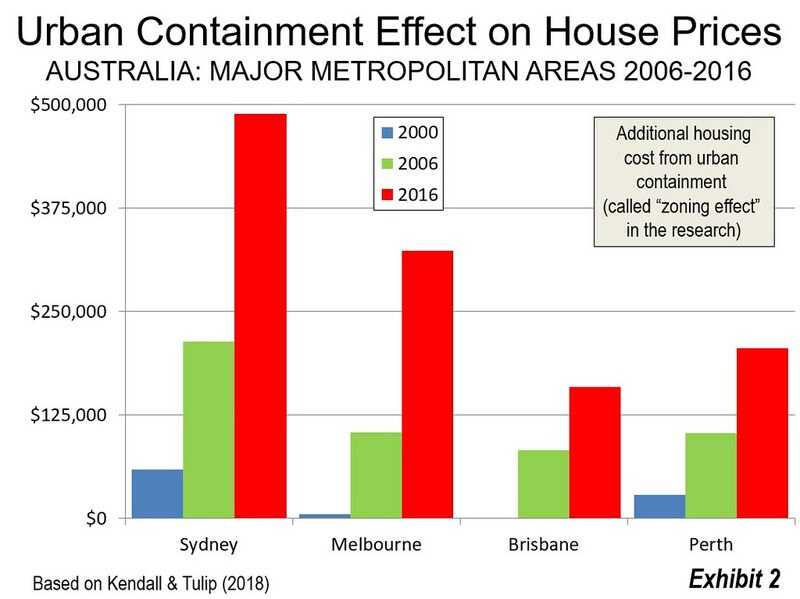 According to the research, and assuming typical mortgage provisions, (Note) the urban containment effect (our term) adds from $150,000 to nearly $500,000 to house prices in major Australian metropolitan areas --- this is not the house price, but the additional impact of urban containment (Figure 2). 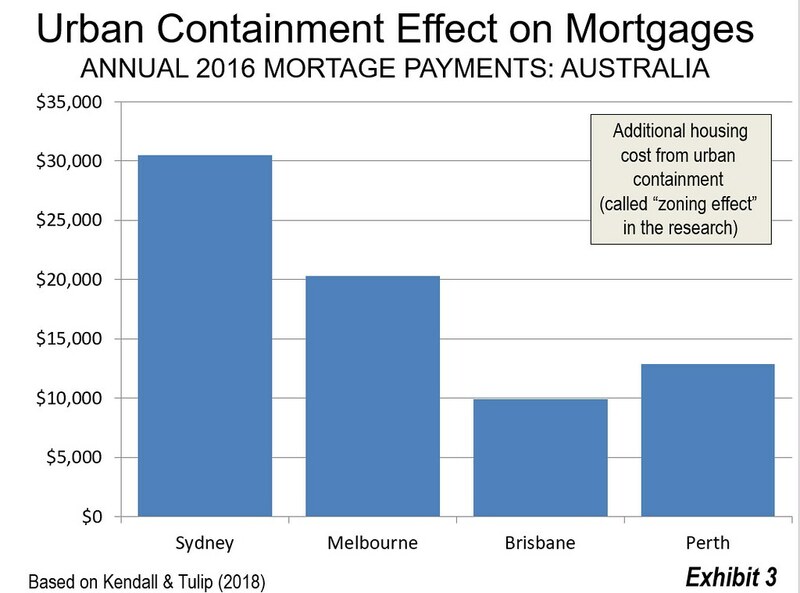 The urban containment adds up to $29,000 to annual payments on the average house in Australia’s major metropolitan areas (Figure 3). •	In Sydney, the urban containment effect adds $489,000 to the house price making the annual mortgage payments $29,000 higher. Figure 4 shows the components of the average house price in Sydney. •	In Melbourne, the urban containment effect adds $324,000 to the house price, making the annual mortgage payments $19,000 higher. •	In Brisbane, the urban containment effect adds $159,000 to the house price, making the annual mortgage payments $9,000 higher. •	In Perth, the urban containment effect adds $206,000 to the house price, making the annual mortgage payments $12,000 higher. •	No data is available for Adelaide, but the present median multiple (median house price divided by median household income) suggests that urban containment effect adds at least $13,000 to the mortgage. The obvious solution is to bring back competition by allowing any landowner on the outskirts to subdivide subject to reasonable environmental constraints. The result decrease in prices will flow through to all markets. This will not suit land hoarders, but will provide our young people with the opportunity to own their own home. Recsei gets to the heart of the matter. Public policy should seek to maximize the standard of living and minimize poverty. Urban containment does the opposite. Under the current policy framework, housing affordability is likely to continue getting worse. The RBA researchers were not so much concerned about stronger, recently enacted regulations. They noted that regulation has not been materially strengthened 2000, but that nearly all the urban containment effect had added much more to the price of houses just because as demand has risen, the effects have gotten stronger. In this observation the researchers raised an issue usually missed --- that when land use regulations are too tough, they continue to drive prices higher, unless reformed. 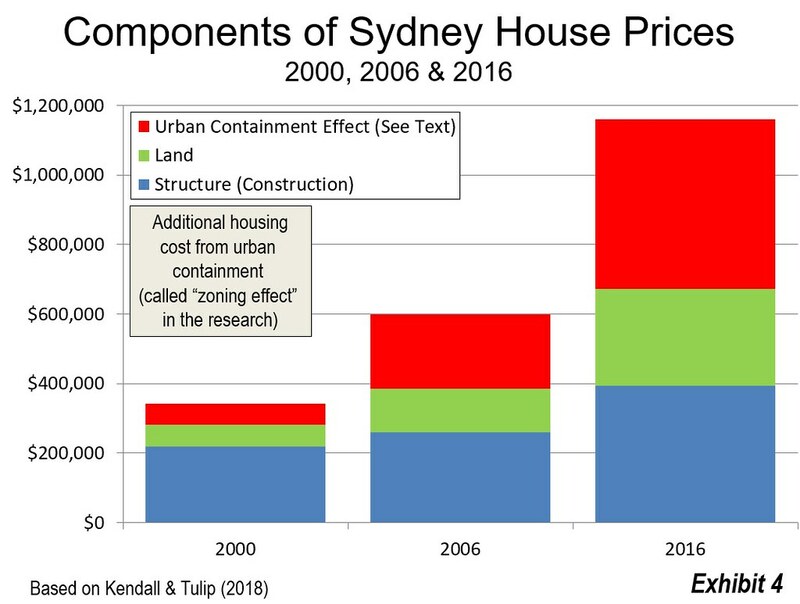 So long as Australian cities have housing markets distorted by urban containment, more and more Australians will be denied the “Dream.” And, it can be expected that more investors, foreign and domestic, will be drawn to Australia’s rigged housing markets. It is as if a “Speculators Welcome” sign has been hung from the Sydney Harbour Bridge (photograph above), a boon to speculators but a bane to the ordinary aspirations of Australians. Note: Assumes a 5 year fixed rate 30 year mortgage, with monthly payments (from the Westpac Mortgage Repayment Calculator, https://www.westpac.com.au/personal-banking/home-loans/calculator/mortga...).